Puppet Parade is an interactive installation that allows children (and adults) to use their arms to control larger than life creatures projected on a wall in front of them. The project was created by created by Design I/O, a studio specializing immersive, interactive installations and utilizes openFrameworks, an absolutely awesome artistic coding framework. Beside the puppet masters, children can go onto the stage and interact with the puppets directly, petting them or making food for them to eat. 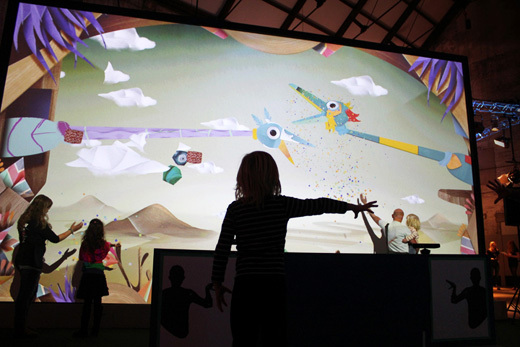 This “dual interactive setup” lets kids perform alongside the massive puppets, blurring the line between the ‘audience’ and the puppeteers and creating an endlessly playful dialogue between the children in the space and the creatures. Puppet Parade premiered at the 2011 Cinekid festival in Amsterdam. The project is based on Design I/O’s Kinect Puppet Prototype video and uses two Xbox Kinects to track the arms of the puppeteers. Puppet Parade is made with openFrameworks and ofxKinect. Sound Design by MOST Original Soundtracks. The installation creates such a wild, out-of-this-world experience, and really pushes the boundaries of how technology can be used to simulate and realize our imaginations. If you’re interested in taking a deeper look at how the actual installation works, definitely check out Creative Applications‘ review, which explains the way the designers used two Kinects to track movement and make the puppets move in 3D space. Check out all of TNW’s favorite experimental projects and apps here, like Thicket: An audiovisual playground for your iPad.